.......53 Buddhas and Me .................My Life Adventures.....: Medicine Wheel 2011 - 2012 & My gift to Who? Once again this year I have had my Medicine Wheel 2011/2012 done by the lovely Michelle of "Joy Express". 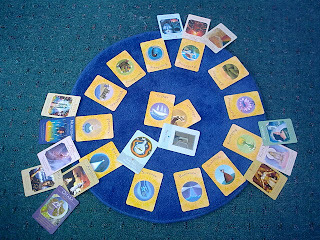 I was so totally amazed with my 2010/2011 Medicine wheel that I had no hesitation about going through the process again. So now here I am the first day of August and my message for this month is "Playfulness" - I like this word because I definitely like being playful. We all know what the word "Playful" means but when I really looked into the word and what it means to me I was quite amazed and the many words I came up with. But the one that really resonated in my brain today was "Have a disposition to find or make a cause for amusement". So with that in mind I decided to combine two things in my life. I love my blog and I love designing and making jewellery so these are the two ingredients of my amusement this month. I have decided to give TWO of my readers a piece of my jewellery - yes TWO. To be in the running all you need to do is leave me a comment during August and on August 31st I will announce the winner. So please go on leave me a comment and you never know you just may be a winner. Just clicked on your blog from FB to check out what you've been up to! 2 beautiful new grandchildren I see - lucky you! I've heard of the Medicine Wheel cards but have never seen them. What interests me most is the Medicine Wheel approach in therapy, it's the holistic healing method and I believe that an individual can't begin to heal if they don't include spirituality... spirituality being their definition, not mine. In my Social Work courses they teach us the mental, emotional and physical aspects of healing to a degree, the spirituality is not mentioned at all. The cards sound like an interesting way to take a look at the Medicine Wheel, I'm going to have to check it out one day! I like what the cards told you! :-) Have a wonderful evening my friend! You are such a nice friend to have and basically i love what ever you may GIVE TO ME!!!!!!!!!!! In future I will try my name. Hi Lou, Darlene & Suzie - thanks for your comments and yes you are now in the running to win a piece of my jewellery. Davine, I love my Medicine Wheel Layout ... my theme this month is Gratitude and I am Very Grateful you reminded me of this fabulous process!